Humanscale has taken a look ahead at the future of the workplace and the role design, ergonomics, technology and sustainability will play in the evolution of the office by asking five experts — all leading authorities in their respective fields — to share their predictions alongside thoughts of what they hope to see in the years ahead. Todd Bracher shared his insight as a prominent industrial designer in the office arena; Dr. Alan Hedge and Dr. Bethany Barone-Gibbs each weigh in with their findings in ergonomic research; Tome founder and CEO Jake Sigal imparts his perspective on the lasting impact of new technologies; and James Connelly, Living Product Challenge Director at the International Living Future Institute, reveals his forecast for the impact sustainable design is likely to achieve on the workspace in the coming years. Ergonomic design for the workplace is becoming a worldwide trend. It’s becoming more pervasive and more popular because it’s based on fundamental change in terms of how people do the work they do and how they use technology. Though not yet universal — a lot of existing office space is legacy — as companies change and move to different facilities or renovate, employers are seizing the opportunity to invest in a healthier place to work. Increasingly, new technologies are allowing people to work from positions beyond their workstations. When these alternative spaces are well designed, they have a beneficial impact on employee health and well-being and increase employee mobility. When designed badly, they can increase stress by exposing workers to an increase in noise, a reduction in privacy and by inviting unhealthy postures. Ergonomics is about allowing the human body to use technology to do work in a way that does not lead to injury, obesity, discomfort or other problems. If there’s one thing designers must keep in mind as they continue to develop the spaces in which we are to work, it is the form and function of the human body. It may be easy for designers who are influenced by visual appearances to look at the aesthetic of something without thinking “Does this make sense for how the body works best?” yet there are a number of new incentives for them to consider the human body more carefully in their work, including accreditation from LEED and WELL building processes. By and large, we have engineered physical activities out of our lives. No one is completely sure if this is what is causing the obesity epidemic, but using surveys we know that people are burning less calories during the workday and that impact can build up over time. In a recent study we conducted at the University of Pittsburgh, we found that periodically alternating positions with a height-adjustable workstation provides a small calorie boost, even over the course of a single hour. Although calorie expenditure is small, there’s no interruption of work between sitting and standing postures, plus there are a number of other benefits that come from alternating between postures — like less pain and discomfort, and less sleepiness. We have to find ways to build energy expenditure back into our day. Sit/stand desks are a good fit for current office culture and a good way to get people moving without interrupting their work. It’s also important for workers to have the opportunity to integrate other kinds of movement during the workday. This is something designers can influence as the office space continues to evolve. In thinking about the evolution of the workplace, we’ve been looking at an aging workforce. Baby boomers are retiring later; it’s interesting to think about the impact that will have on the way we all work. If you have to keep working into your seventies and beyond, but do not want to miss out on time with family and grandkids, you will not be working the way we work now. It starts with less time working in the office and more time remote. Therefore, it is critical to have a better work-from-home experience for the employee and the employer. Using technology, we can improve the virtual workspace, increasing productivity regardless of work location. We will look to technology to create a remote work experience that mimics the face-to-face work experience on site. New technologies will also help people to manage their remote work experience better and more efficiently. The bigger focus for us around the connected office is not about the furniture or the space — it’s about work and how to integrate home life and personal needs with work life. It’s about redefining work-life balance. I anticipate that we will see the emergence of office furniture that is increasingly relevant to today’s contemporary culture. We are currently seeing what is labelled as “residential design” as a strong influence in the workplace, but I feel this is a misrepresentation of the shift that is happening. Solutions for the workplace are softening and the challenging of traditional expectations are not due to a “residential influence,” but rather due to a change in what to accept as the norm — which is now part of our daily lives, our contemporary culture. The notion of working strictly in a cubicle-like atmosphere is becoming increasingly irrelevant and our work tools are transforming how we collaborate, challenging traditional notions of how an organization works. The rise of small and medium-sized businesses rooted in non-traditional business sectors do not feel the need to subscribe to the half-century old notion of what a workplace must appear to be. It’s now about defining a company’s own voice and brand DNA that resonates top to bottom, through the product to the workplace experience. Brands wishing to compete in this contemporary culture must understand that in order to stay relevant. “What does good look like?” To date, the sustainability industry’s focus has been about how do we make things less bad, use less energy, and use fewer harmful chemicals. Instead, we believe that design has to have a positive impact, supporting human and environmental health and well-being. Material health is a critical way to impact human health and the environment, if you look down the supply chain. Consumers are becoming more aware of material impacts on health and owners and operators of commercial office space recognize that materials have a direct impact on the health of occupants. Of course healthy, sustainable design goes beyond materials. We learned long ago that placing zoo animals in concrete boxes made them sad, increased rates of illness and decreased life expectancy, yet we’ve only discovered in the last few years that placing humans in cubicles is bad for their health and well-being. Designers are realizing it is time to break away from the traditional office space. They’re finding ways to blur the lines between indoors and outdoors and integrating principles like biophilia — an important trend that is just now beginning to catch on — to bring nature into buildings. Inviting nature into the workspace helps to invigorate an environmental ethic, yet it also reveals a clear connection as to how nature helps to improve health. As we’re testing out new approaches to design and new types of materials in line with the principles of biophilia, we’re seeing that new technology can actually measure the benefits of these designer interventions on stress levels and encourage the worker to action. Technology gives us feedback on the benefits of healthy and sustainable design. It allows us to continuously monitor air quality, for example, and thus to develop a better understanding as to what in the environments is having an impact on air quality. Individual users can also connect with technology to monitor their responses in the workplace and learn how the environment is impacting their health and well-being. It’s intuitively obvious that humans feel better in nature, but having the data from technology to measure the benefit shows employers the tangible benefits of integrating nature into the workspace and makes the business case more clear at every level — for the designers and contractors as well as employers and employees. A once staid landscape, the office reflected little substantial change for decades until recently. 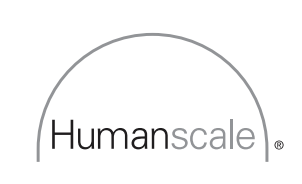 In his interview with Humanscale, Bracher noted that within his 20-year history in the design industry, he’s only observed significant changes in the contract design space within the last decade. These changes are driven by cultural shifts that are substantive and long lasting and by new technologies and discoveries that are transforming the way one works. This evolution creates a world of opportunity for the leading forces in design, ergonomics, technology and sustainability to shape the future workplace to reflect society’s new ideals and provide better support for the environment and the human body.